22 March 2018, at 12:00a.m. Angela Zhang, IQC Insights, provides an in-depth analysis of China's pork industry over the last 12 months and adds her predictions for the industry in 2018. China’s expanding pork import volume in 2016 made overseas pork exporters more ambitious for this huge market in the beginning of 2017. We indeed witnessed such a positive trend from January to March 2017. China’s pork import volume reached 346,151 tons in Q1 2017, increasing by 21 percent than the same period last year. However, as shown in the following chart, the market turned down sharply from April 2017 on. Especially during a specific five-month period (June ~ October 2017), China’s pork import volume remained at a low level, fluctuating between 83,000 tons and 90,000 tons each month. 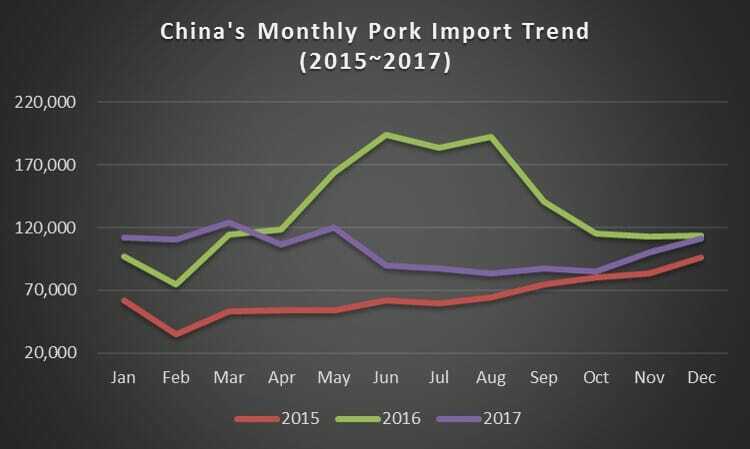 China's monthly pork import trend in 2015, 2016 and 2017. Firstly, increased domestic pork supply - the slaughtering volume of fixed hog slaughterhouses in China reached 221.82 million head in 2017, growing by 6.3 percent than 2016. Secondly, decreased domestic pork prices - the annual average live pig price was CNY14.8 per kg in 2017, declining by 19 percent on a y-o-y basis. A similar scenario was experienced with the domestic pig carcass price, which went down by 15 percent from CNY24.4 per kg in 2016 to CNY20.8 per kg in 2017. As a result, the price gap between domestic and imported pork was greatly narrowed. Thirdly, the domestic end-consumers traditionally prefer fresh pork to frozen pork, while the latter was mainly purchased by domestic food processing enterprises. Among the above-mentioned reasons, the most important one is the gap between domestic and imported pork CIF prices. With the rapid increase of labour and land costs in China, domestic slaughtering and processing enterprises chose imported pork to cheapen the cost of their raw material. Therefore, China’s pork import volume is directly proportional to the gap between China’s pig carcass price and imported pork CIF price. China's pork import and price gap between domestic and overseas markets between 2015 and 2017. As shown in the above chart, a trend that is usually observed is that when the domestic pork price increases and the price gap with overseas markets is enlarged, the pork import volume rises; when the domestic demand for pork is weak, like the period from May to October 2017, the domestic pork price decreases. As a result, the price gap is narrowed and the import volume declines. Another important factor that should not be ignored is shipping time - it usually takes one or two months from European-American countries to China so the impact made by the price gap on pork import volume is prolonged accordingly in a similar manner. 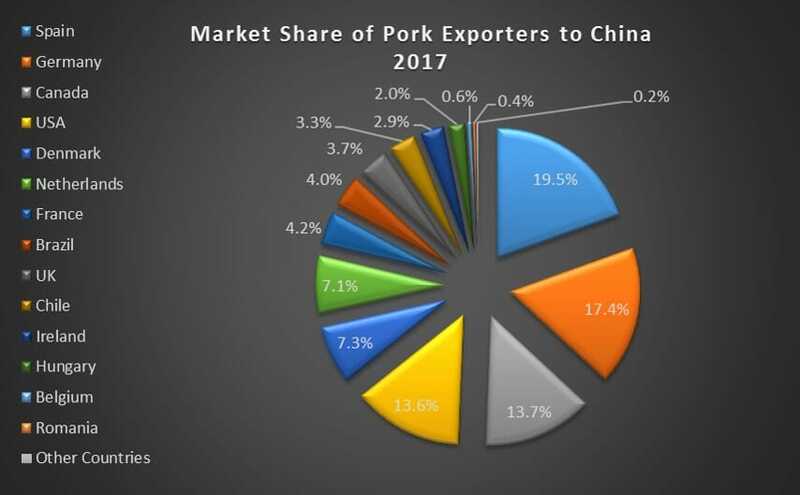 In terms of the market share of pork exporters to China, Spain exported, in total, 237,514 tons of pork to China in 2017, ranking top among all exporting countries. With a market share of 19.5 percent, Spain was followed by Germany (17.4 percent) and Canada (13.7 percent). Market share of pork exporters to China. Note: Other countries include Mexico, New Zealand, Finland. Compared with 2016, the volume of 15 countries exporting pork to China declined. Only the UK and Mexico achieved a y-o-y increase of 5.7 percent and 738 percent respectively. However, when it came to the export value, the UK also showed a y-o-y decrease of 4.9 percent. Mexico achieved the largest growth rate of 738 percent among all countries, but the export volume to China remained at a low level, from 171 tons in 2016 to 1,433 tons in 2017. Besides, factors, such as China’s increased pork supply and narrowed price gap between domestic and overseas pork markets, development in other countries also influenced their exports to China. In the case of Brazil, its rotten meat scandal in March 2017 caused the pork export volume to China to decrease by 39.6 percent to 48,716 tons in 2017 on a y-o-y basis. In addition, seven German pork plants were suspended by China’s General Administration of Quality Supervision, Inspection and Quarantine for 4 months, which could largely explain its noticeable y-o-y decrease rate of 38.5 percent in pork export volume to China in 2017. 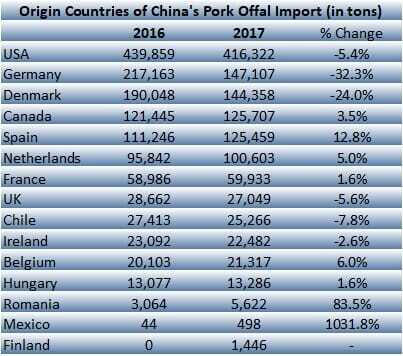 As for offal export to China, despite a y-o-y decrease rate of 8 percent, offal from all origin countries performed better than pork export in 2017, because China is the major importer for many offal products from European and American countries. For such offal products, mainly heads, belly spareribs and hind feet, China is the main consumption market globally, due to Chinese people’s traditional dietary habits and religious taboos in some overseas regions. In other words, there are fewer substitute markets for these offal products so offal exporters are more inclined to adjust quotations according to market changes. Otherwise, some products, such as neck bones and tailbones (especially those from USA and Canada), could also be sold to South Korea Japan or Africa, in case these markets offer more competitive prices. Countries from where China receives importation of pork offal (volume in tonnes). Ranking the 5th among all offal exporters and with a market share of 10.1 percent, the offal export of Spain to China increased by 12.8 percent in 2017 on a y-o-y basis. Compared with other offal export countries, it also achieved the largest incremental quantity of 14,213 tons in 2017, partly because a number of new Spanish plants were approved to export offal to China, or previous bans were lifted in 2017. Following its weak domestic trend in 2017, China’s pork prices could continue to stay at a low level in the pork cycle. The major reason for this is that numerous domestic small and medium-sized pig farms have been demolished over the past three years, while large-scale producers are taking this opportunity to expand their production capacity with greater productivity. As a result, the increased production capacity is expected to be released from 2018 on. For more details, please refer to my previous article. However, considering the much higher long-term pig breeding cost for Chinese producers than their overseas counterparts, it is a rare circumstance that the domestic pork price would continue to decrease to the same extent in 2018. Coupled with the possible decrease in overseas pork price due to an oversupply in the new year, the price gap between domestic and overseas pork markets would continue to exist. In addition, Chinese RMB appreciated by 6.3 percent against the US dollar in 2017. It further strengthened by 2.5 percent from 1 January, 2018 to 5 March, 2018. The appreciation of Chinese RMB and the historic low exchange rate of USD/CNY since November 2015 would continue to stimulate China’s pork import, together with its more open international trade policies in 2018. Therefore, China’s pork and offal import is expected to continue with the high volume of over one million tons respectively in 2018.